John Le Carré's best-selling novel, 'Tinker, Tailor, Soldier, Spy' has already been adapted for television and the radio so it was almost inevitable that a big screen version would emerge. Any tension about the film's quality was immediately relieved upon seeing the cast list, featuring three generations of incredible British actors - including John Hurt,Gary Oldman and Tom Hardy. Yet it still arguably fails to live upto expectations. "There's a mole right at the top of the Circus." 'Tinker, Tailor, Soldier, Spy' takes us into the heart of an internal investigation into the top rung of the British Secret Intelligence Service (MI6) to establish the existence and identity of a Russian double agent. Retired spymaster Gary Oldman is charged with the operation, collaborating with Benedict Cumberbatch and the slightly unhinged Tom Hardy to find the truth. The subtleties of the plot and its non-linear narrative make 'Tinker, Tailor, Soldier, Spy' a significantly slow burn - all the more so, when the final reveal lacks punch. Perhaps the former elements would have been more acceptable if the ending had felt more decisive, instead of damp. The major problem of the film is that the potential moles are rather glossed over (Ciarin Hinds particularly) meaning that when the double agent is revealed, it is difficult for the viewer to do more than just shrug their shoulders. Which is pretty much the same reaction as the characters in the film, in fact. What director Tomas Alfredson does fantastically well is create an evocative feel of the period and setting of his film. His excellent debut feature, the Swedish vampire horror 'Let The Right One In', embodied a detached nature that truly befit the film's subject matter. Similarly, his work here portraying a suitably bleak Cold War-era Europe, with cinematographer Hoyte Van Hoytema, is outstanding. The acting does not quite match the magnificence of the look of the film - largely due to the lack of screentime for many of the characters - but it is still of a high standard, such that Colin Firth appears little more than average. Gary Oldman is being talked up for a Best Actor nomination at next year's Oscars and while his performance is strong, he is at least equalled by Benedict Cumberbatch and arguably John Hurt and Mark Strong also. 'Tinker, Tailor, Soldier, Spy' has generally found itself in two circles now - as a critically lauded "masterpiece" or derided as overly self-indulgent and dull. In reality, it is somewhere in between. A wonderfully shot, evocative film that disappointingly deprives us of seeing the best of its staggeringly good cast. 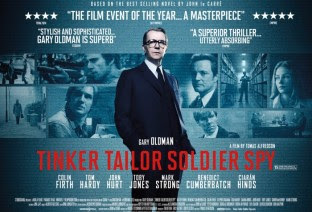 'Tinker, Tailor, Soldier, Spy' is on wide release throughout UK cinemas now.